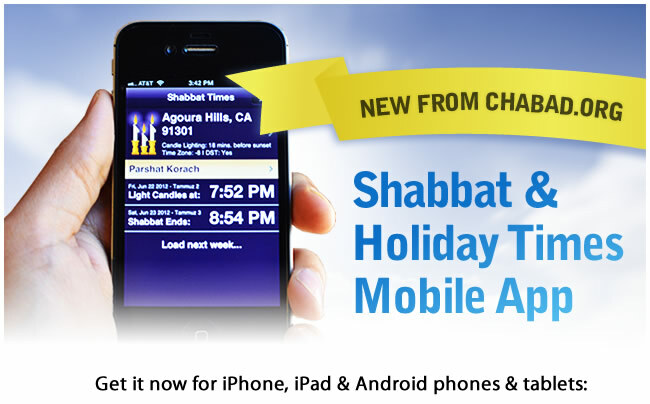 The Shabbat & Holiday Times app will quickly and easily get you the times you need for the upcoming Shabbat and Jewish Holidays. Times are automatically selected based on your current location and you can choose to show times for any other location worldwide by entering a city or US Zip code. The app lists both Shabbat and holiday candle lighting as well as the time the Shabbat or holiday ends. It also provides quick access to more information on the upcoming Parshah (weekly Torah reading) and Jewish holidays from the wealth of information provided by Chabad.org. Use this app to get accurate Shabbat times, powered by the #1 Jewish website Chabad.org.